Okonomiyaki is made from flour. Filled with beef and cabbage, cooked on teppan. It served hot with toping sauce, katsuobushi, and mayonnaise. Okonomiyaki tasted crunchy, but melt in the middle, because the sauce tasted soft. Okonomiyaki sauce is a mixture of oyster sauce, Shoya, and sugar. It is tasted sweet spicy. With the addition of katsuobushi, make Okonomiyaki tasted more savory. It makes Okonomiyaki seen waiting to be eaten. 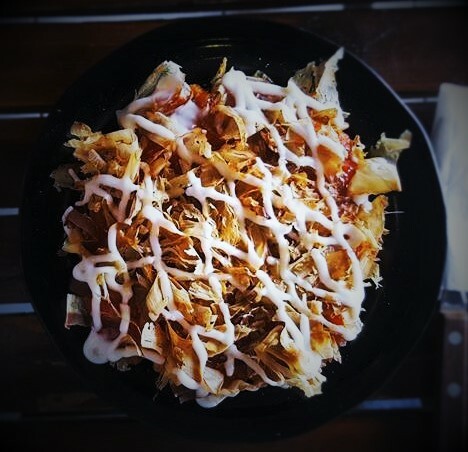 You just need 15,000 IDR to get Okonomiyaki. Okonomiyaki can be found at Ranjang 69. It is usually open from 11 AM until 9 PM everyday. It is located beside Favorit (stationery stores), 7 minutes walk from Gerlam. Nasi Ganteng + Soy sauced Omelette is the bomb for relieving hunger. Talking about it, the best place and the most popular place to get this kind of fried rice is BKI Pajawan. 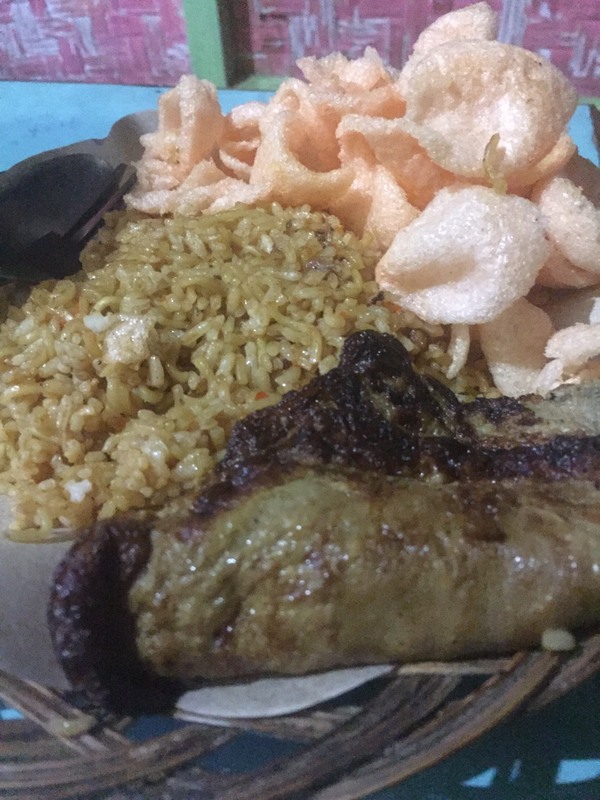 Popular among the fan of fried rice and students in Jatinangor, Nasi Ganteng is different from other fried rice is it is fried with noodles with other sauce and spices and sometimes the taste of spicy sauce leave a mark in my tongue. The omelette itself mixed with soy sauce makes the flavour salty and sweet at the same time. The combination of rice, noodles and well seasoned omelette makes it really tasty. BKI Pajawan is located in the lovely neighbourhood of Jatinangor, behind Koramil office. 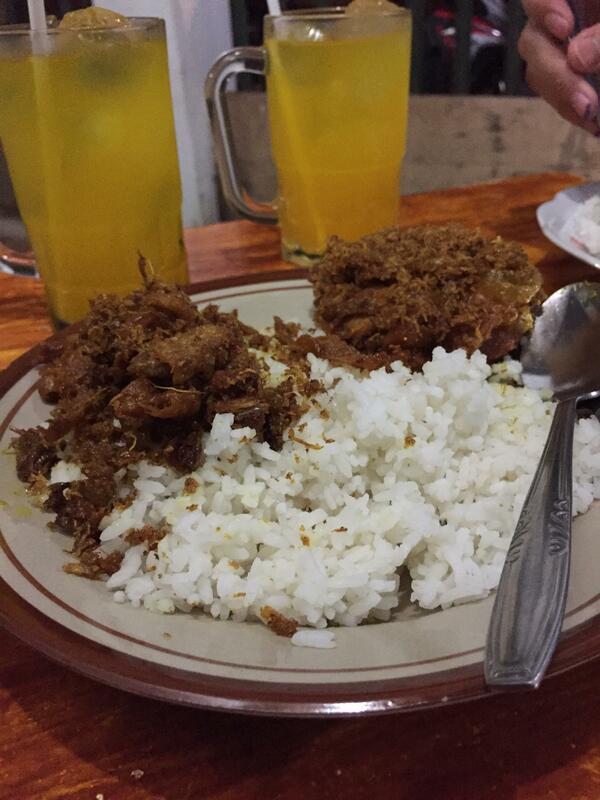 The shop open 24/7 and takes about 10 minutes walking from Gerlam Unpad. I ordered Nasi Ganteng with the side of soy sauced omelette with the cost of IDR 12,000. Nasi Tongkol, Tempe Orek, Sayur Sop, and Sambel in Warteg Sayang (famous as WS) could be your first solution in the financial crisis at the end of the month. 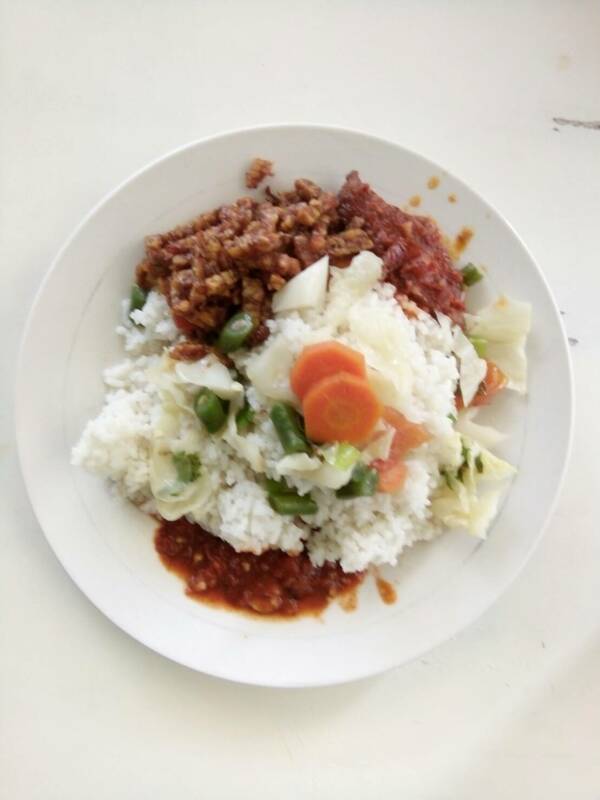 The rice is purely white, tasteful, and the smell is like calling us to eat it sooner. The tongkol looks totally red with slices and flecks of chili above. Tempe Orek of WS is crispy, brown-colored, and served with spicy red sauce. This Sayur Sop is salty and filled with slices of carrot, chicken, green beans, and cabbage. If we want more of spiciness, we can have sambal as an addition, it is optional and free. This menu is priced IDR 7,500. We can reach this Warteg Sayang by 15 minutes of walking from Gerlam. It is open from 6.30 AM to 10 PM, or sooner if the foods are out of stock. If you seek for foodgasm, you might want to eat Mie Ayam in Mie Bakso Kangkung. Fresh light color balance on one bowl will boost up your appetite in moment you see it. Strong chicken flavored broth yet light balance the shredded chicken meat that tasted sweet and savory. If you find the taste is less strong, you can add salt or sambal. The noodle is thinner than usual noodle and easy to chew. Boiled kale that still crunchy and chicken feet also add fibrous composition to the bowl. Last touch that brings this menu to be one is difference texture from chewy meatballs and crispy fried dumpling wrappers. 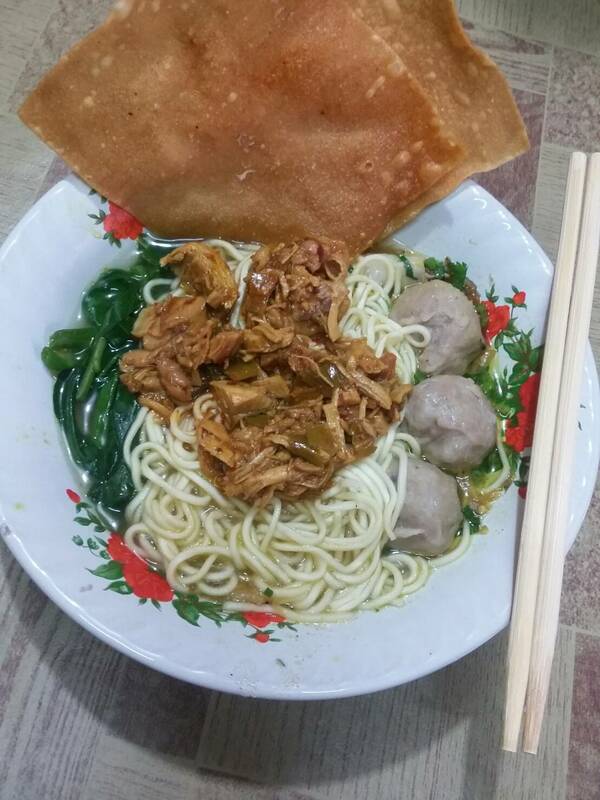 You can afford Mie Ayam in Mie Bakso Kangkung with IDR 15,000 in pocket. You can walk for about 10 minutes from Gerlam to Jalan Raya Jatinangor No.182 there you’ll find Mie Bakso Kangkung open at 8 AM until 9 PM.